After returning to the DRC from the USA, where we participated in our daughter Nicole’s wedding, we found that people were in a negative mood so we began to search for the reason. We finally discovered that they were waiting for the electoral results to know who the next president of the country would be. They announced the name of the new president on February 10that 3:00 a.m. as the alleged winner. The real winner wasn’t proclaimed as the president. People weren’t enthusiastic and only kept silent to avoid bloodshed. The expectation of the people was not to see Kabila or his party in power. Unfortunately, that didn’t make a difference and the plan for retaliation was in place — the internet and communication were cut off. All this made us wonder so we took time to step back and traveled to Europe to observe. 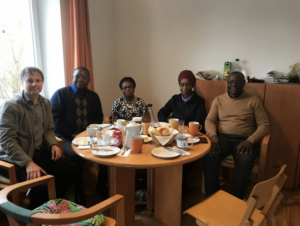 The time we spent in Europe was very gratifying as we visited our friends who are Lutheran pastors in the Germany/Bavaria area. We also had a chance to meet with Dr. William Obaga and his wife Margaret and share with them our mission plans. Now we are back in the DRC with enthusiasm to serve the Lord. Here is the testimony of a farming couple who have been going through financial hardships. Mr. and Mrs. Luyindula are part of our farmer’s forum team. 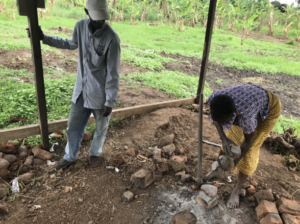 Their home life was chaotic until the day they joined the forum where they listened and learned about God’s plan for humanity. Mr. Luyindula considered himself a child abandoned by God because He never provided for his needs. His marriage was close to breaking and he didn’t know what to do. Mr. Tito Senga, who is a friend of Luyindula, told him about our forum gathering. 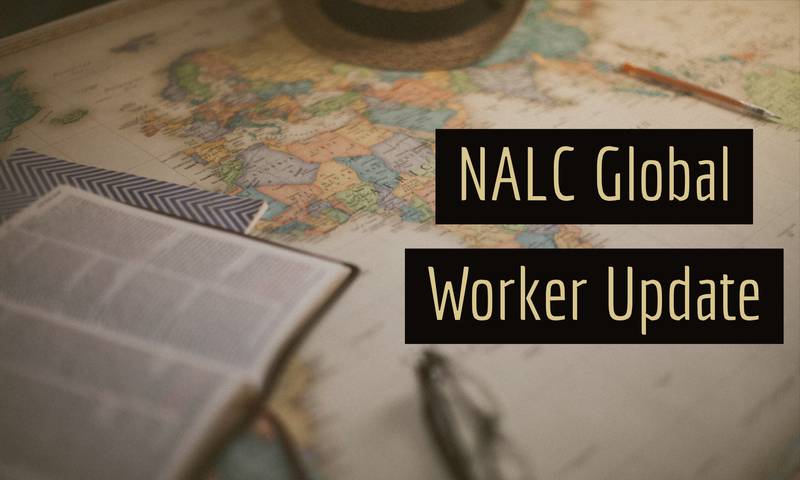 Luyindula and his wife, Delina Luyindula, came to assist and learned about the plan God has for them as written in Jeremiah 29:11-12 (NIV), “‘For I know the plans I have for you,’ declares the Lord, ‘plans to prosper you and not to harm you, plans to give you hope and a future. Then you will call on me and come and pray to me, and I will listen to you.’” After they learned this, we listed them as recipients to receive farming seeds, such as peppers, tomatoes and cucumbers, which they planted and harvested well. From the sales of their crops, they were able to increase their income and send their children to school. Now they will be planting rice, onion, spinach and many other crops to continue to increase their income. The couple was so thankful for the advice and support and thanked God for His provision. Mr. Albert Tsobo and Mrs. Emilie live a very poor life in the remote area of Kinzau-Vuete, a city situated 70 km from Boma toward Matadi. Albert Tsobo and Emilie are faithful member of the Confessional Lutheran Church. They are parents of five children, Albert does not have a job and Emilie is an elementary teacher at a private school that helps underserved children. Her salary is $95 a month but payment is not consistent. In many occasions she gets paid two or four months late. Albert became an alcoholic and was violent toward his entire family. No one could control Albert’s behavior and the church reported their situation to us for counseling. At the first counseling session, I learned that the couple’s youngest child, five-year-old Richard, was blind from birth and Albert had never accepted Richard child as his own. 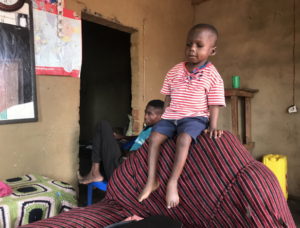 Most of the household problems were related to the blindness of the child and they don’t have money to see if they may take the child to a vision clinic for screening. Albert and Emilie are in counseling sessions and we are praying that we may find an opportunity for Richard to see an eye doctor. Please pray for Richard and his entire family. Deacon Lucky was traveling to Kinshasa for a family issue and the taxi he was in collided with another taxi bus. Since Lucky was seating in the front, he became the prominent victim of the accident. He died on spot and the body was transported back to Matadi. It is very sad to see how his biological and church families struggled and mourned for his death. 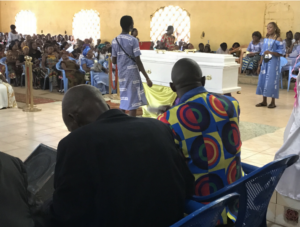 A group from Boma, including choirs, pastors and we, as missionaries, traveled to Matadi on Wednesday, February 20thand participated in the funeral Thursday, February 21. May his body rest in peace and peace to the church and his family. Lucky left behind a widow and three young children. For more information or to connect with the Panzo Family, please visit: The Great Commission Society.